Are you considering a replacement or upgrade to yo ur water heater? If you had a tanked water heater, you could consider a move to a tankless system and realize the benefits of endless hot water! A tankless water heater is just what it sounds like: a system that heats your water without having a reserve tank of water to draw from. If you’ve ever had water heater burst, you can see one major advantage of going tankless! As it makes hot water on demand, you won’t have to worry about running out of hot water as stored in a traditional tanked water heater. Another benefit of tankless water heaters is that they are compact, offering a space savings. Additionally, while the up-front cost of a tankless system may be more than a traditional system, you will experience benefits from energy savings down the road. 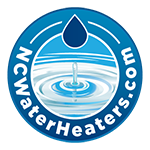 Talk to NCWaterHeaters about how a move to tankless might make sense for you. We’ll discuss energy savings, available incentives, space savings and internal or external placement of the heater for maximum effect in your home or business. We offer tankless systems from manufacturers like Rheem, Rinnai, Navian, G.E. and more. Make sure to discuss our one year labor warranty on all water heaters we install and ask about how we can save you $200 on new tankless water heaters. Some models are eligible for utility company rebates and incentives. NCWaterHeaters is a certified Duke Energy HEIP contractor.